Striking a balance between basic and applied issues, this one-of-a-kind, single-source reference covers the design, operations, diagnostics, and testing of electrical insulation in high-voltage power networks. Furnishes a thorough knowledge of the fundamental properties of dielectrics essential for the optimum design of power systems! Providing a comprehensive survey of advanced digital and electro-optic techniques used in both the field and research, Electrical Insulation in Power Systems examines the mechanisms of gas discharge and the air clearances necessary on transmission network and substation equipment explains SF6 circuit breakers, gas insulated switchgear (GIS), the mechanisms that control breakdown in SF6 gas, and performance of SF6-related equipment describes liquid, solid, and vacuum dielectrics as well as dielectric classification, electrical properties, conduction, and breakdown mechanisms addresses composite insulation as well as polymeric and oil-filled cables elucidates high-voltage testing techniques, internationally accepted classifications, test procedures, and standards and more! 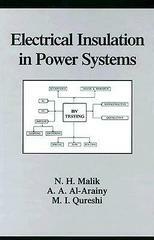 Generously illustrated with over 200 drawings, tables, and photographs, Electrical Insulation in Power Systems is an indispensable, hands-on guide for electrical and electronics, high-voltage, insulation, electrical-power, transmission and distribution, chemical, and materials engineers; polymer chemists; dielectric physicists; materials scientists; and upper-level undergraduate and graduate students in these disciplines.